Bloodhound SSC designed to break the record fastest car in the world from 1.609 kilometers per hour has begun. The construction Bloodhound SSC is a breakthrough for the British teams who are creating, and formally marks the end of a meticulous design process led by chief engineer Mark Chapman. The biggest challenge in designing the fastest car in the world is to keep the car running in top soil, said Chapman. We spent two and a half years devising concepts and eight months ago we managed to create the aerodynamic shape completely stable at 1.380 mph, and not rise. It was a time when we turned on the focus, says Chapman, adding that it gave them the way of the future detailed plans for the interior and exterior of the car. The chassis is made of a carbon fiber composite, made by Advanced Composites Group, the UK, while the rear half of the car is made of a steel lattice covered with a layer of aluminum. The thin frame of Bloodhound SSC, nearly 13 meters long, 1.5 meters wide and two meters high, will house three different engines. In the center of the fastest car in the world is a Formula 1 engine of 800 horsepower, created by British company Cosworth engine. This not only helps drive the car, but also function as auxiliary power unit to turn the other two engines: a Eurojet EJ200 and a rocket test peroxide. 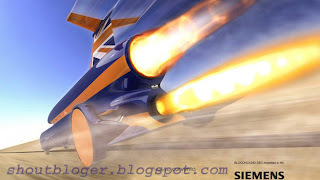 Combined, the Bloodhound SSC will generate 133.000 horsepower, equivalent to 1,200 family cars or 160 cars in Formula 1, according to Chapman. It is no surprise that the order of 6.4 tones will not be the fastest car in the world, and can be overcome by a Bugatti Veyron, the fastest car on the freeway, if they are to compete to reach from 0 to 160 km / h because the Bloodhound takes 15 seconds, compared with the seven it takes the Veyron. But the Bloodhound SSC goes from 160 to 1.600 kHz in 25 seconds. And at that rate, says Chapman, with a blink you might miss everything. "You could be sitting on the Wembley Stadium and the car would go from side to side while you blink" he said. 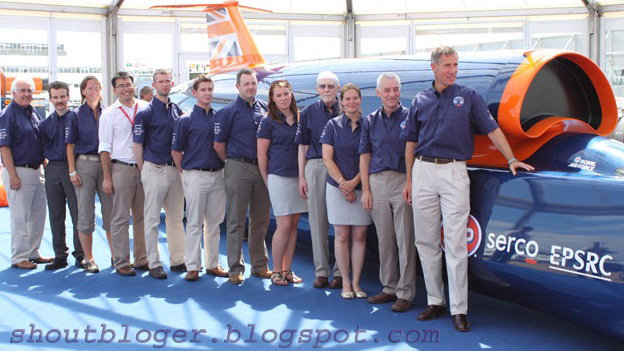 The air commander Andy Green will be the driver of Bloodhound when attempting to break the record in late 2012 or early 2013. Green is an experienced pilot of the British Royal Air Force and was at the wheel of the Thrust SSC when it set the current record land speed of 1228 km / h in the Black Rock Desert in Nevada in 1997. But 1.600 kHz is a big step for everyone involved in the project of the fastest car in the world. "The Thrust SSC was designed to run at 1.367 km / h. We can predict what will happen to 1.280 km / h, but after that we do not know exactly what will happen, "said Chapman. "The biggest uncertainty is how the desert surfaces damage or no damage to the tires, because the only way to know is doing it." Chapman and his team have spent two years looking for a suitable location to test him. The traditional areas where they break speed records usually are neither large enough nor sufficiently flat, he says. Construction is expected to be completed within one year and the first test on the track takes place in the spring of 2012.